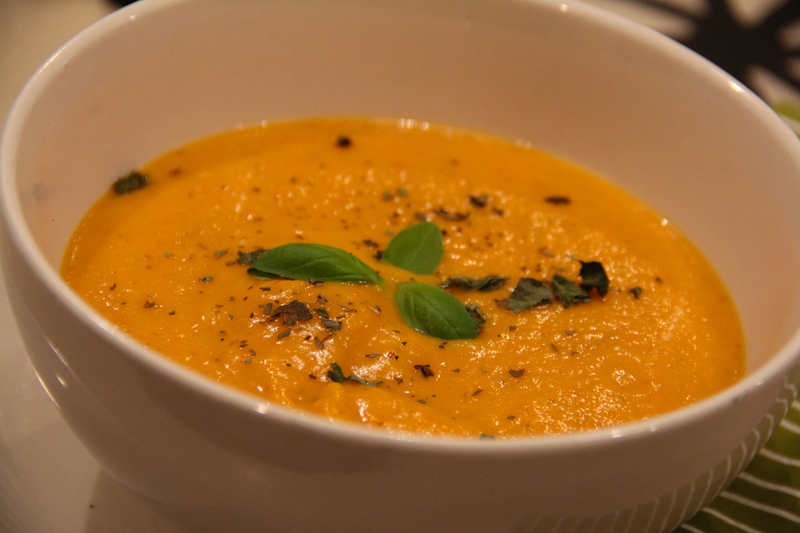 I know I know- some of you are thinking, “What are you doing making soups in May?” Well let me tell you, I LOVE SOUP! 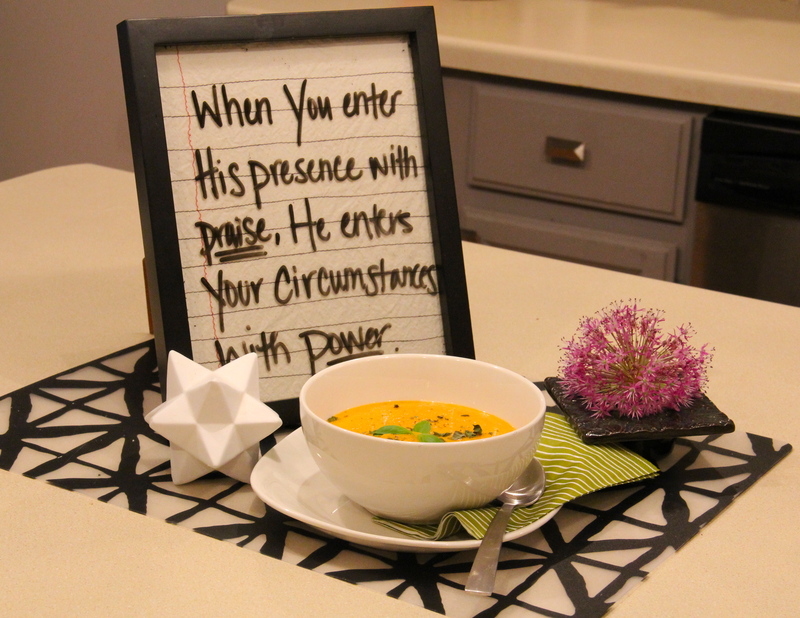 I am not constrained to certain seasons when it comes to enjoying soup. I’ll agree with some soups having their places in certain seasons, but to me- soup is the ultimate comfort food. Today in Wisconsin, it’s rainy and dreary so I just felt like cuddling up with a good book, hot tea and some soup. Can ya blame me? I happened to be perusing the tv last week (a rare occasion seriously) and I stumbled upon a cooking show on PBS-The Jazzy Vegetarian. 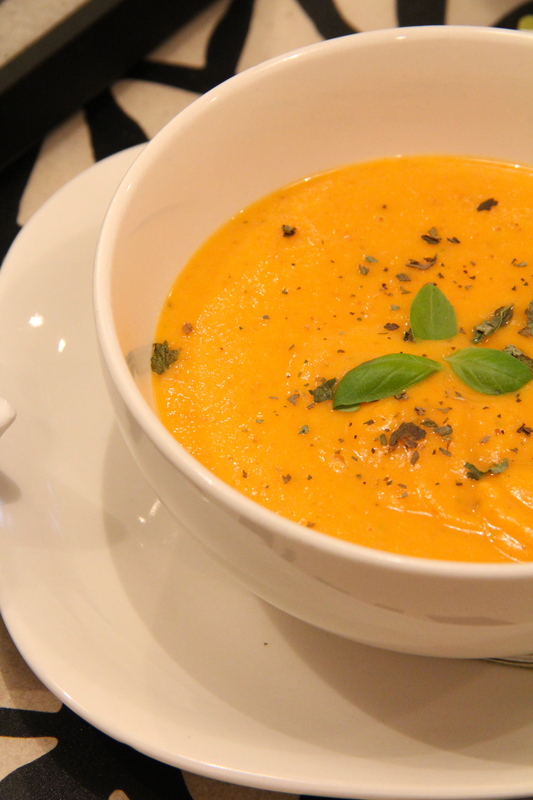 She happened to be making this creamy dreamy carrot soup and I got the bug to make it. The ingredients are ones that most people have on hand all the time which makes this a really great go-to soup. Now the lady is vegan so she didn’t use any animal-derived ingredients so I tweeked it a little and made it my own way. So if you’d like the original recipe check it out on her website or for my version follow the steps below. First step is to steam the carrots and potatoes together until soft (roughly 10 minutes). Combine the milk, stock, brown sugar, italian seasoning and soy sauce in a bowl and once the veggies are steamed- mix them in too! Put the combined ingredients in a blender and puree until creamy and smooth. 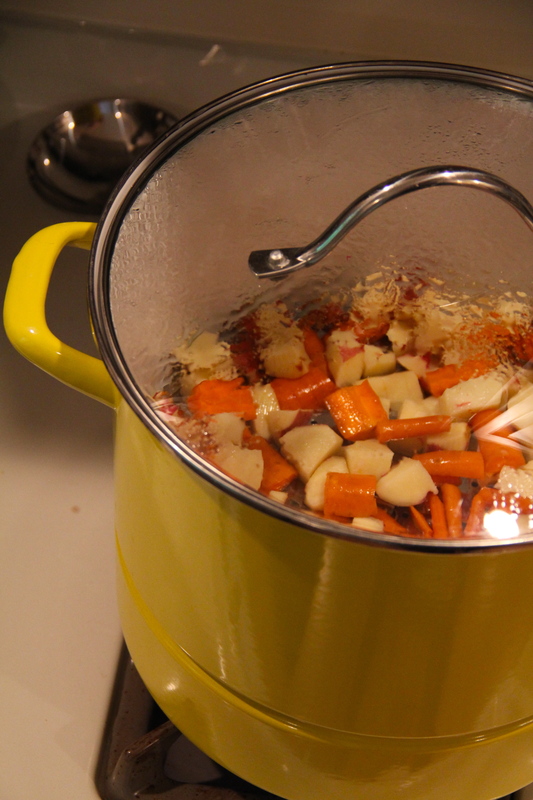 It works best to do half a batch at a time so it can really puree the carrots and potatoes well. Also, depending on your blender size, it probably wouldn’t all fit at once. Add salt and pepper to taste. At this point if you are making this ahead of time, you can put the soup in a pot and refrigerate until you serve it. Then just plop it on the stove and heat it thoroughly. Lastly, garnish with some fresh herbs and voila! Now could it get any easier than that? I don’t think so. It’s going in my recipe box as quick soups with ingredients I already have on hand. I hope this spurs you on to trying a new recipe this week. For those who only eat soup in fall and winter, I challenge you to let your guard down and try a new soup. Bon appetite! One last note, I’ve been finding words of wisdom on Pinterest lately and have been writing them in plain sight as a means of keeping some inspiration going throughout my day. What do you do to keep inspired?